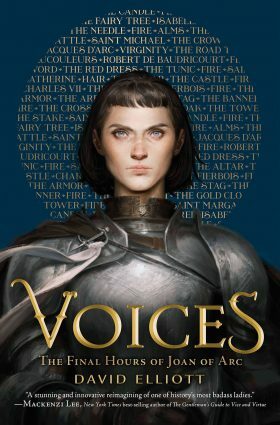 A French Soldier—The book cover of “Voices“ where Joan of Arc looks fierce in her armor. “Voices: The Finals Hours of Joan of Arc” by David Elliott shows the life of Joan of Arc before she became a hero and how she changed history through the eyes of those around her. It is a good book as an introduction to Joan, but it barely touches on the controversy of her life. The book retells Joan’s life through various medieval poems told by Joan, individuals and objects central to her life. “Voices” is a historical-fiction that takes bits of monologues from transcripts of the Trial of Condemnation and the Trial of Nullification. The Trial of Condemnation shows the case of Joan in 1431 where she is charged with relapsed heresy. The Trial of Nullification is a retrial of her case 24 years after her death. Elliott captures a different side of Joan’s life than most people know. Joan is often viewed as the hero who led the French army to victory against the English during the Hundred Years’ War. She is also known as the hero who was burned at the stake for the crimes charged against her. “Voices” shows us her life before she became a soldier and how she wasn’t always a hero but just a girl who followed her passions. The book starts off with a poem in the perspective of the candle. This candle held the fire that was to be the death of Joan. “As we walked to the church, I was burning; she was my darling, my future, my fuel,” it read. This was the moment of Joan’s death and Elliott gives us a visual of the scene as if the fire was alive. Starting off with the poem of the candle is a good approach to grab the reader’s attention. It makes them wonder what other objects are shown in the book. From the narrative of Joan’s mother to Joan’s warhorse, the whole book is like a diary written by these characters. Elliott gives voices to objects as if they had a mind of their own. The book stands out from other books regarding Joan of Arc. For those unfamiliar with her, this book is a good way to get a glimpse of her story. It gives readers the basics of what happened in that part of history. Others saw Joan as a saint, others saw her as an aberration, but because the story itself is vague, it’s a little hard to get a full view of exactly what occurred. The book focuses on the emotional aspects of the characters, so it doesn’t go into detail on how the war was played out. It is evident that religion plays a big role in Joan’s life. The Catholic church is often mentioned in the story as well as the controversy of gender identity that Joan goes through as she starts dressing like a man, but Elliott doesn’t delve into that. So if readers want to know more about that, this is not the book to read. If readers don’t know anything about Joan at all, this book is a good introduction to her life. It touches upon her domestic life, how her parents felt about her decisions and the possible reasons for her death. The symbolisms in the book are fun to read. The red dress, for example, symbolizes feminity and Elliott dedicates a poem of Joan denying it. We get Joan’s perspective as she takes off her dress in exchange for a tunic, what men wore. We are also given a poem of the skirt itself and then the tunic. Comparing the two clothings in their poems, readers can see what they truly mean to Joan’s character. The whole poem was a symbol of her rejection of her past life. It was the transition from Joan the girl to Joan the warrior. “So I stepped out of the red dress and left behind the masquerade, the costume, and the mask. And with it Joan the girl and daughter, and her domestic tasks,” Joan said. It’s the type of story where the end is already made known. It is the journey of Joan that is important, so readers could know how she started and how she met her end. It’s interesting how the author tied the end with the fire as well. Readers learn throughout that the fire has always been a part of her, even long before her death day. Elliott wrote in different forms of poems popular in Joan’s lifetime. He included ballades, rondeaus, sestinas, rondelets, triolets, and villanelles. For those who are not familiar with different types of poems, they might not seem apparent. Elliott, however, makes it easy for people who aren’t really interested in poems to enjoy it as well. With less than 100 poems in 186 pages, “Voices” is a quick read. It’s not the book for a deep analysis of Joan’s story, but it’s enough to get a basic information on it.